Chasing Shadows is a searing look at the impact of one random act of violence. Before: Corey, Holly, and Savitri are one unit—fast, strong, inseparable. Together they turn Chicago concrete and asphalt into a freerunner’s jungle gym, ricocheting off walls, scaling buildings, leaping from rooftop to rooftop. After: Holly and Savitri are coming unglued. Holly says she's chasing Corey's killer, chasing revenge. Savitri fears Holly's just running wild—and leaving her behind. Friends should stand by each other in times of crissi. But can you hold on too tight? Too long? In this intense novel, told in two voices, and incorporating comic-style art sections, Swati Avasthi creates a gripping portrait of two girls teetering on the edge of grief and insanity. Two girls who will find out just how many ways there are to lose a friend . . . and how many ways to be lost. And I see... Everything Change. Time sl-o-o-ws. Sounds stop as my brain captures images, frame by frame. My mouth goes bone-dry. I can't manipulate my tongue to say anything, not even to scream. He fires over and over - a fast spray of bullets. The Dana rocks with the impact. When he is a foot from Holly's shattered window, he squares his shoulders, steadies his aim, and fires again. At the same time he pulls the trigger, I scream - "NO!" - but the shot smothers my voice. "We're going to get through this, Holly. And you know how?" Dear Death, Trying to Move on is like building a sand castle while the waves keep rolling in. Her mouth returns to a flat line. Which is better. Anything is better than that dishonest smile. Anything is better than the Move On mantra she spouts. Last week, she cleaned out Corey's room. Next week, I'm supposed to Return to My Routine. But first I must visit Corey's grave. The moves for her three-step dance to the theme music of Closure. Screw Closure. I love graphic novels. I think the art work is amazing. I love that you can get so wrapped up in a story through just pictures and dialogue. The fact that Chasing Shadows is both a prose novel and a graphic novel is something I knew I couldn't pass up. Of course, the synopsis did help a bit in my decision to read it. The story itself is heartbreaking. Savitri witnesses Corey's murder and Holly's attempted murder from a car not 45 feet away and is racked with survivor's guilt. Holly herself nearly dies and is in a coma for about a month after the attack. While in her coma, Holly envisions herself in the Shadow Lands with Corey and a half-man half serpent named Korha, who is taking Corey's soul to the Cage of Souls. When Holly does wake up, she is obsessed with rescuing Corey and isn't ready to fully move on. Svaitri on the other hand is doing her best to be there for Holly, who is slowly unraveling, while trying to deal with Corey's death herself. You can't help but feel for these girls. I find it hard to relate to either character. No, that's not right. Both characters are very believable and I can picture them vividly in my mind. They both stand on their own merit and have distinct personalities. My problem stemmed from that fact that I couldn't/didn't want to have to think about my boyfriend or little brother (I know Holly and Corey are twins, but I don't have one of those) being murdered right in front of me. Some of these scenes are so profoundly emotional that I found tears in my eyes. At these times all I wanted to do was lock my brother and boyfriend in the basement. I don't care that they're bigger and stronger than I am. I'd find a way. But back Chasing Shadows and the majestic writing ability that is Swati Avasthi. It's not just what is happening in the scene that makes them so emotional. It's Avasthi's writing. Her words are strong and her sentences just flow. You picture yourself in this story, but not as an outside. You are Holly and Svaitri. You're the one who lost their boyfriend and wrestling with the decision of going to Princeton or staying with Holly. You're also the one who lost their twin and are determined to bring him back from the Shadow Lands. Told in alternating narration, both Svaitri and Holly have strong voices. I always find it intriguing when authors write a dual perspective in first person, but I'm also wary. Avasthi however had no problem whatsoever pulling off the dual narration. If anything, it made the story stronger.. Even without checking the chapter headlines, you know exactly who was talking. Her writing style differed slightly between the two girls, which I found completely wonderful. The artwork, done by Craig Phillips, serves to enhance the story. While I would have liked to have seen more of his work, I think it is the perfect addition. I love the scenes that Avasthi and Philllips chose to illustrate, making the novel feel more personal on some level. Even if you're not a fan of graphic novels, you cannot pass up the opportunity to read this harrowing story about two young girls dealing with the murder of a loved one. With an engaging story line, beautiful illustrations, and wonderfully written prose, Chasing Shadows will stay with you long after you finish the last page. Hi Andrea. 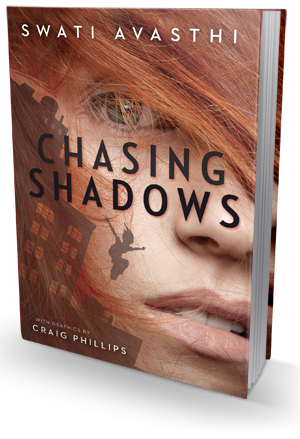 Thanks for hosting me and CHASING SHADOWS on our blog-wind tour! But to know me, you’d never expect it. I am a fairly happy,extroverted person – friendly, smiley, supportive. I’m the person who strikes up a conversation while waiting in a line, or in a coffee shop, or in the grocery store. My family jokes that everywhere I go, I meet someone I know. And it’s somewhat true, because I meet so many people. So why do my stories come out so dark? Why does my imagination haunt me with twisted images that must go onto the page? I tell my students that imagination is a know-it-all. When DNA evidence was first introduced, the legal system had to do a double take. Eye witness testimony, that which had been deemed the most reliable type of evidence, was discovered to be shockingly unreliable. Because if you give someone part A and part Z of a story, the imagination will fill in the rest. Your mind fills in what happened in the gutter between the panels. You don’t see the death, but you aren’t left wondering either. Writers use the imagination of the reader to fill in the line breaks in poems, the chapter breaks in novels, the subtext in dialogue, and the details in setting. In fact, if we use the reader’s imagination then it’s usually a better experience for them because their imagination will tell a personalized story. Hence the old axiom: show, don’t tell.And sometimes, go a step further and don’t even show, when you want a custom tailored fit for each reader (like Hitchcock liked to do in his films). I use my imagination’s know-it-all tendencies to create characters. I ask my characters questions and the know-it-all fills it in, with a personalized voice for each. For a story idea, I tell my students, ask yourself a question, give yourself a dilemma you don't understand, like why someone would beat their spouse and what would you do if you watched that as a child? Like what happens to friends when violence rips through their lives in a seemingly random shooting? Imagination is our tool to reconcile that which we can’t understand. Or those things we aren’t equipped to understand when they are presented to us. Write what you know? Write what you want to know. When I was 18 I learned from a news story that a friend from middle school, whom I hadn’t spoken since we went to different high schools, was shot and killed in what is still an unsolved case. We had been pretty close – surviving ridiculous middle school fights, having sleepovers, enjoying birthday parties. In the moment I found out, I simply wasn’t equipped to handle death. I hadn’t known anyone well who had died and I thought I was invincible (being 18). I didn’t know what it meant. I was stunned into a prolonged silence about it – not talking to her family for twenty years, until I finally found the simple words I needed to say: I’m sorry for your loss, and I grieve for all that she didn’t get to do with you and your family. That frozen state, those events that we can’t handle in the moment, are fertile ground for the imagination. We can’t make sense of the gulf between the old normal and this new reality, so we let the know-it-all in our brains try. Our imaginations are a great way to solve theunsolveable, fix the unfixable, recoverthe unrecoverable. Because fundamentally, the other thing the imagination is, even for the darkest of us, is an optimist. A hardcover of Chasing Shadows by Swati Avasthi to one lucky Bookish reader! Do not cheat as I will verify all entries. Nobody likes a cheater anyway.